The Cadillac CTS-V benefits from GM performance parts like the 5.7-liter LS6 V8 from the C5-generation Chevrolet Corvette Z06, as well as the Corvette Z06's six-speed manual Tremec transmission. From 2006 onwards, the LS6 engine was superseded by the new LS2 engine as used in the base 2006 Chevrolet Corvette. Unique front and rear treatments also included mesh grilles over the front openings, a track-ready suspension, and eighteen-inch wheels inside of Z-rated Goodyear Eagle F1 Supercar run-flat tires. 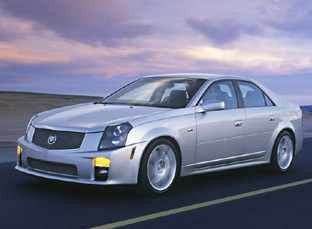 The CTS-V was the first car launched under Cadillac's V-Series performance brand which competes with BMW's Motorsport division, Mercedes-Benz's AMG division, and Audi's S- and RS-Series performance-luxury cars. The handling has improved thanks to the Opel tuned chassis and Brembo brakes.